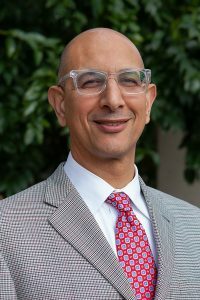 Dr. Mark Ghaly was appointed Secretary of the California Health and Human Services by Governor Gavin Newsom in 2019. In this role, Dr. Ghaly will oversee California’s largest Agency which includes many key departments that are integral to supporting the implementation of the Governor’s vision to expand health coverage and access to all Californians. Dr. Ghaly will work across State government, along with County, City, and private sector partners, to ensure the most vulnerable Californians have access to the resources and services they need to lead healthy, happy, and productive lives. Before joining Governor Newsom’s team, Dr. Ghaly worked for 15 years in County health leadership roles in San Francisco and Los Angeles. In San Francisco, he was Medical Director of the Southeast Health Center, a public health clinic located in the Bayview Hunters Point community. In addition to having a large primary care pediatrics practice, Dr. Ghaly led the clinic’s transition to the patient-centered medical home model of care, expanded specialty care and diagnostics services, and addressed issues such as teen health, youth violence, food security, and environmental health issues. In 2011, Dr. Ghaly became the Deputy Director for Community Health and Integrated Programs for the Los Angeles County Department of Health Services. In this role, Dr. Ghaly directed clinical operations in the Los Angeles County Juvenile Detention system and led the transition of jail health services from the Los Angeles County Sheriff and the Los Angeles County Department of Mental Health into one integrated system of care. Dr. Ghaly also led a County team to expand health and behavioral health services on the Martin Luther King, Jr., health campus in South Los Angeles, which included the opening of the public-private Martin Luther King, Jr., Community Hospital. Additionally, Dr. Ghaly was the architect of the Los Angeles County Whole Person Care Pilot program, oversaw the launch of the Drug Medi-Cal Organized Delivery System in Los Angeles County, and established the County’s Office of Diversion and Reentry which has diverted over 3,000 individuals out of County jail and into community-based treatment and permanent supportive housing. Among Dr. Ghaly’s most important accomplishments was the creation and continued development of the County’s Housing for Health program. Since 2012, Housing for Health has supported over 6,500 chronically ill individuals facing homelessness, many of whom are stuck in acute care facilities, to gain permanent supportive housing through federal subsidies and LA County’s Flexible Housing Subsidy Pool. Dr. Ghaly continues to see patients in the Los Angeles safety net system, currently working at Olive View UCLA Medical Center. Mark’s prior clinical work within Los Angeles County also included seeing patients at the Los Angeles County Juvenile Detention System and the Martin Luther King Jr. Outpatient Center Medical Hub that serves children and youth in the Los Angeles Child Welfare System. Dr. Ghaly looks forward to continuing his clinical practice while serving as the State’s Secretary for Health and Human Services. Dr. Ghaly was born and raised in Minneapolis, Minnesota. He earned duel B.A. degrees in biology and biomedical ethics from Brown University, his M.D. degree from Harvard Medical School, and his M.P.H. from the Harvard School of Public Health. Dr. Ghaly completed his residency training in Pediatrics at the University of California, San Francisco. Dr. Ghaly is married to Christina Ghaly and has four young children. Dr. Ghaly is honored to serve Governor Gavin Newsom and looks forward to forging partnerships and relationships across California to make the Governor’s vision a reality for the benefit of all Californians.